In India today, 4% of our children never start their elementary Education, 58% don’t complete their primary schools and over 90% don’t even complete their schooling. At DEHAT, the fact that only 10% of the targeted children are able to go to the college both saddens and oblige us to pull hard for them. Every child can and must obtain an extraordinary education. No child’s demographics can determine his or her destiny. To us, the end of educational inequity is the freedom for all children to have the opportunity to reach their potential. And the day that all children reach their potential is the day that India reaches its potential. DEHAT believes that day will come in our lifetime and furthermore this will take a movement of leaders from the communities all around the globe with the idealism, belief, skills and commitment to actualize this vision. We are committed to find, develop and support India’s brightest and most promising leaders for this to happen. The minimum range of govt. primary schools from the households is 1-3 km, middle schools 3-5 km and high schools are located at the distance of 5-20 Km, because of these long distances and security reasons, none of the parents could allow their girl-child to go to the schools. At grass root level, on an average, girls are getting married at the age of 5-13 years. No govt. schemes are accessible due to lack of literacy and awareness. SPICE stands for School Premises for Innovative & Creative Education. Believing that Govt. Schools are the only alternate for poorer and deprived children. It aims to bring a dignified and a empowered life for illiterate rural women and prepare them to take independent initiatives. For building support for girl child education and increasing community involvement with the learning centers. 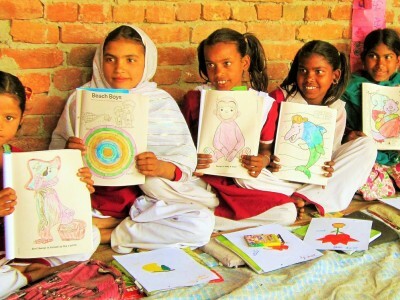 Classrooms uses a variety of learning materials including wall paintings, chart, games, songs, poems, and activities to make girls’ education engaging and multidimensional. Home visits and parent-teacher meetings connect staff with students’ families and homes. These visits have convinced parents to reduce household chores, increasing regular school attendance by 25%.Teachers also learn about potential marriages, allowing them to counsel families against child marriage and for continuing girls’ education. The girl child plays the role of a teacher on a rotating basis, where they mentor gradual level girls and build their confidence and knowledge by teaching peers. Training sessions throughout the year, shared lessons and teaching tools with all teachers and support staff. Teachers were advised on the use of engaging teaching materials like flash cards, color charts, word matching, and peer teaching, which they have implemented in their own classrooms. For breaking outside normal school activities and expanding their creativity and imagination. Students co-lab with teachers, pradhans, government officials, block pramukhs and other community members to share songs, paintings,and nukkad natak(street plays) in celebration of Independence Day, Gandhi Jayanti, Children’s Day and Republic Day, and learn about the importance of these holidays in the process. Project staff organizes rallies, meetings, home visits, and workshops for World Women’s Day, World Hand Wash Day, Iodine Deficiency Disorder Day, and World Breastfeeding Week, benefitting students and communities with the knowledge of these topics. Fortnightly performance review meetings and regular meetings between project and support staff helped teachers and staff communicate with each other. To let each girl introduce and explore the historic and geographical sites DEHAT organizes an exposure visit to Historical monuments to widen the knowledge base of the children. Staff and students from low-performing centers also have exposure visits to high-performing centers, allowing teachers to improve their own centers. Students from American Universities interacts with a small group of students at our alternative learning centers, providing our students a chance to learn about the importance of education and gain inspiration from the interaction. Dropout girls in target villages’ identification through door-to-door contact with families and student registration to continue their education. Impacting a population of over 2,00,000 children in Uttar Pradesh. Reached over 14,500 adolescent girls directly through our Rural Education Initiatives. Empowered over more than 5 lakh community members through awareness campaigns. Stopped over more than 30 child marriages. Hundreds of illiterate mothers of students were inspired and were taught to read by their daughters. 98% of women in literacy centers can sign their name, and 76% mastered advanced literary exercises. 98%girls who took board exams with coaching center support passed with good ranks. Instead of a burden, now education is a joyful instrument for the children in our Initiatives. Honored as a finalist for the Dasra Girl Power Award, Education category.